This Pierre Cardin AOP Trim Polo is crafted with a regular fold over collar and 3 button fastening placket. It features short sleeves and ribbed trims for a comfortable fit. 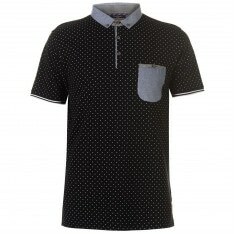 This polo shirt has a chest pocket as well as split hems for added style and is a lightweight construction. It is an all over print design with an embroidered logo and is complete with Pierre Cardin branding.